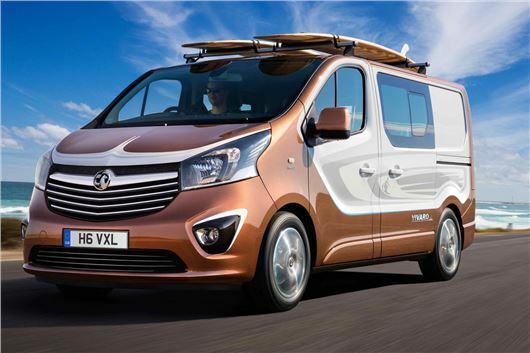 The Frankfurt Motor Show will see the debut of the Vivaro Surf Concept from Vauxhall. As the name suggests, it’s a van made with surfer types in mind, featuring a surfboard bracket on the roof and plenty of custom storage in the cabin. Resplendent in copper brown and sitting on Irmscher alloys, the rear floor has a bespoke rail system, while the rear row of seats incorporates a storage box spanning the width of the cabin. Seating up to six, the interior has been fitted by custom fabricator Sbnoeks Automotive, and includes blue lighting in the interior walls. We'll have to wait until the Frankfurt show to see all that, though the overhaul extends beyond the fixtures and fittings, with a rear air suspension system not only providing a water-like ride quality (in theory), but lowering the ride height for a more aggressive overall look. The tailgate is electrically powered too. Power comes from a 1.6-litre CDTi BiTurbo diesel engine, with fuel consumption rated ar 46.3mpg. Vauxhall says that the Surf Concept may go into production, though it’s more likely to form the basis of a Limited Edition specification Vivaro focussed less on business use and more on ‘lifestyle’ buyers. The star of Vauxhall’s Frankfurt stand is set to be another lifestyle vehicle – the all-new Astra Sports Tourer.